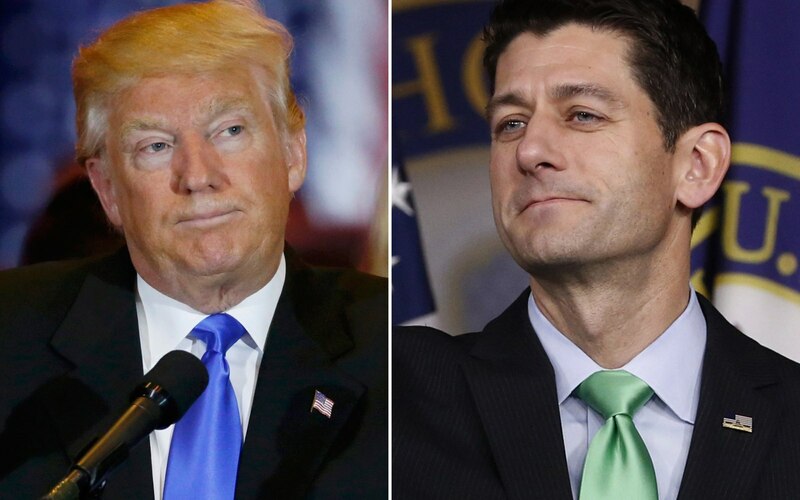 As far as Republican leaders go, Ryan was almost perfectly designed to clash with Trump. He favors immigration reform with a path to citizenship, expanding free trade and above all, reducing entitlement spending to rein in long-term debt. Trump has made the opposition of all three ideas central to his campaign. They’ve also clashed on issues of tone and tolerance, with Ryan criticizing Trump in the past for his proposal to ban Muslims from entering the country and for Trump’s hesitation to disavow support from white supremacists. So what did Ryan get out of his dramatic standoff? Not much. Sources close to the speaker rejected the idea there was a “negotiation” or “concessions” in exchange for support, and instead characterized the endorsement as the product of an “ongoing process” in which the two men are becoming more comfortable with each other’s agenda and personality. When it comes to rhetoric, it’s clear Trump remains Trump. In recent weeks, Trump has criticized Republican Gov. Susana Martinez of New Mexico; slammed a federal judge presiding over a class action suit against Trump University, who he said, “happens to be, we believe, Mexican” (the judge was born in Indiana); and invoked a discredited conspiracy theory about Vince Foster, who committed suicide in 1993 while serving in the Bill Clinton administration. Nor does Trump’s threatening language against Judge Gonzalo Curiel do much to quell worries about his commitment to “separation of powers” and stopping “executive overreach,” two items Ryan said were important to their discussions. Trump has shown little concern for these topics in his campaign. At one point, he threatened in a debate to force American military leaders to commit war crimes before backing off and saying he would ask Congress to legalize torture first. Asked whether Trump has done anything to reassure Ryan about his tone, the source turned the conversation to policy, which was said to be the prime drive behind the endorsement. Trump hasn’t budged on entitlements, immigration or trade, but nothing he’s said inherently conflicts with items on Ryan’s agenda on poverty, health care or tax reform, on which the House GOP is planning to roll out more specific proposals in the next few months. The hope is that if elected, Trump would approve of the Congressional GOP’s approach to issues where he’s shown less interest in naming concrete plans. Ryan also said Trump assured him of his anti-abortion credentials, an issue where Trump’s list of prospective Supreme Court justices with a conservative bent has helped garner more buy-in from the right. Overall, though the pattern is clear: Ryan came to Trump, rather than the other way around. To be fair to Ryan, he had little leverage to do otherwise. Despite Ryan’s warnings of a divided party, national polls show GOP voters rapidly coalescing around Trump, and even some of Trump’s most vicious critics during the primary, including Sen. Marco Rubio and Gov. Rick Perry, have offered their support. A similar dance is playing out in the Senate, where Majority Leader Mitch McConnell has taken to conservative media in recent days to reassure conservatives that even if Trump bucked their policy goals, the Republican legislature would rein him in. It’s a low bar to clear, but McConnell told CBS last week that in a worst-case scenario, “the Constitution” would restrict Trump.